Two things you should know going into this review: I don't like Falcon, and I don't care about Night Force. Lt. Falcon is a second generation Green Beret and cross-trained in demolitions. He served with the 5th Special Forces Group Airborne "Blue Light" counter-terrorist unit as an "A" Team XO (executive officer). He's also proficient in Spanish, French, Arabic and Swahili, and he's a qualified expert with most NATO and Warsaw Pact small arms. All of the details of Lt. Falcon's military background make him a qualified leader on paper. But it is his dedication to his team and willingness to put his own life on the line for them that earn his fellow soldiers' respect, and made him a natural choice for the GI Joe Team. Over the years, Lt. Falcon has honed his skills from brash, impetuous fighter to cool, calculated tactician. He leads his troops with the same enthusiasm as always, but knows his years of knowledge are too valuable to waist on the battlefield - though he will not hesitate to head for the front lines if his team needs his personal support. His additional training in covert ops and cutting edge technology makes him the perfect leader of Night Force, a team specializing in nighttime surveillance and defensive operations. Night Force, in-universe, is a covert ops sub-group of the GI Joe team that uses advanced skills and technology to attack enemies under cover of darkness. Night Force, in the real world, is an excuse to reuse existing molds by throwing some different paint on them. So, you know, same as Tiger Force, Slaughter's Marauders, or the Python Patrol. Falcon was one of the original Night Force members, released in 1988 in a two-pack with Sneak Peek, so unlike Marujo and Ar Puro, this figure isn't introducing a new concept. His colors match the vintage figure very nicely: he has black boots, brown pants, green webgear, a black shirt with grey sleeves, a green neckerchief, and a black beret. The sleeves are darker than before, and the parts used mean he also has black gloves and green kneepads, but the overall effect is there. And unlike the eyesores on the Tiger Force, he still looks like a military man. This figure uses the same recipe as "Slaughter's Marauders" Falcon: the torso of one Dusty and the limbs of another. 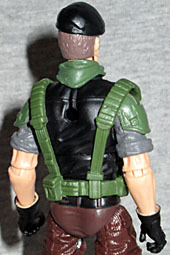 In short, he's wearing a button-up shirt with several pockets on the chest, cargo pants tucked into his boots, and then a bit of armor on his shoulders and knees. His webgear comes from the Cobra Trooper. Why that one, and not the webgear the first Generation 3 Falcon was wearing? We couldn't say. Maybe it didn't fit this torso well enough. 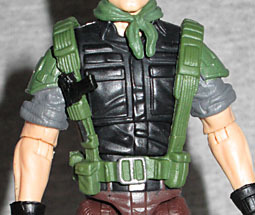 There's a pistol holstered on one of his suspenders, but it's just a sculpted piece, not an accessory. The accessories he does get are nice, though. 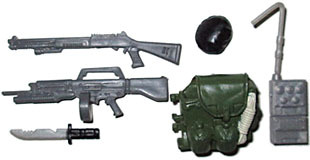 He has an AA-12 machine gun with a drum magazine, a shotgun with a flashlight beneath the barrel, and an update of Falcon's familiar G1 backpack, which is sculpted with a coil of rope and two canteens. It used to feature a bent antenna coming up off one side, but now features an opening flap and a fully removable piece of radio equipment! There's a big, scary knife hanging off the side of the pack, as well. Last year's Joe Con offerings included a set of updated Night Force figures - Spearhead, Muskrat, Psyche-Out, Repeater, and Hit & Run. Add to that the fact that we already had Night-Force-ish versions of Outback, Tunnel Rat, Shockblast, and Beachhead, and you could have a pretty substantial G3 Night Force collection. But until now, you's be missing their leader. I don't have any particular love for Falcon, and I don't care about Night Force, but this is a really nice release. I didn't expect to like him very much, but he turned out well.